Now that my foundation is complete, I can begin to work in a little detail, just one step at a time. I have mixed little puddles of very wet pigments. One puddle is a bit of Permanent Sap Green with a touch of French Ultramarine Blue, another is French Ultramarine Blue on it’s own with some water, another puddle is of Antwerp Blue and another puddle has a combination of the above colors. These puddles are all very, very wet and pale. 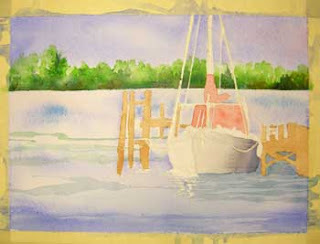 Using a number 10 round, or larger, I applied a pull-push stroke to create some shadows and ripples in the water. The ones in the background are very faint/wet, and smaller in width. The strokes in the foreground are wider and more crisp. I used a clean, damp brush to soften edges here and there to break up the crispness of the lines. Be sure to look A LOT at your photo reference for clues as to where to add the brushwork, where to soften the lines and what color and direction the brushwork should flow.